California Wine Country Fires. Heroes. HEROES. We had to evacuate from the Tubbs Fire late Sunday night, October 8th, but we came home through the checkpoint each day. On Wednesday the 11th, we met CalFire Chief Kevin Ryan and mentioned to him that the Pocket Fire was spreading toward Alexander Valley (our evac locale) and that we were on notice for a second evacuation. Chief Ryan came with us to our place, assessed the risks and told us it would be ok for us to move back home. He told us our property was defensible, but also warned us that there was going to be a big fire show on Mount St. Helena in front of us that night as the winds were shifting. We quickly left and returned with our cats, then went down the road to find another CalFire team to let them know that we had officially moved back. 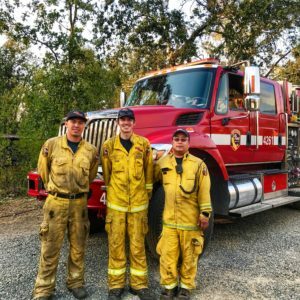 We found CalFire Engine 4261 and these three heroes, Moua, Mike and Gabriel, who came down the driveway with us to see what they would be defending should the winds change direction sending fire or embers our way. They told us that their main concern was the wooded area along the creek and near the barn plus the fallen trees, limbs and branches that were down all around. They gave us advice about how to prepare and where to focus our clean-up efforts. We asked if we should sleep in shifts to keep an eye on the fires that were still raging on the hills surrounding us, but Moua encouraged us to get a good night’s sleep. He told us that it was their job to be watching over us and assured us that they would be doing just that. WOW. They left us with those comforting thoughts, and we got back to work. We couldn’t believe it when, 30 minutes later, these same three firefighters and incredible human beings rolled back down our driveway with extra chainsaws to help us chop up the fallen trees, limbs and branches so we could clear the debris away from the structures and make our home easier for them to defend. They stayed and worked with us -cutting and clearing- until the sun went down! Again, WOW. Heroes! California Wine Country Fires. Evacuees.